Courts have wrongfully condemned thousands of people to long jail terms in "one of the biggest and most widespread miscarriages of justice ever", MPs have heard. The accusation came as MPs debated the need for reform of joint enterprise - which for more than 300 years has allowed courts to prosecute more than one individual for the same offence. In 2016 the Supreme Court ruled that the law on joint enterprise had been wrongly interpreted for more than 30 years. However, since the ruling, no appeals have been awarded and many new cases "with all the hallmarks of the old cases" are being successfully prosecuted, Labour MP Lucy Powell (Manchester Central) told ministers. "We don't use the term 'gangs' to talk about the Bullingdon Club. But we do use 'gangs' when we talk about groups of young men in my constituency". Joint Enterprise creates miscarriages of justice and erodes trust in the criminal justice system. Fellow Labour MP Siobhain McDonagh (Mitcham and Morden) estimated that as many as 4,500 people were currently serving time wrongfully. Ms Powell went on to say that she feared the "cosy club" of the criminal justice system was now "closing in on itself" in order to prevent the issue being fully exposed. She said: "This is potentially one of the biggest and most widespread miscarriages of justice ever to face our justice system." She added: "We can all agree, I think in here today, that the law did indeed take a wrong turn; now that needs putting right. "The establishment is evidently not putting itself right, so Government and Parliament need to act. "We urgently need a review of the use and scope of prosecutions brought under joint enterprise, particularly its disproportionate use against young and black and ethnic minority men. "We also need urgent clarification on the qualification for appeal so we can put right decades of substantial injustices and unsafe convictions leading to many serving life sentences for murders they did not commit." Labour MP Chuka Umunna (Streatham) told ministers that 37% of those serving long sentences for joint enterprise were black, 11 times the proportion of black people in the population. 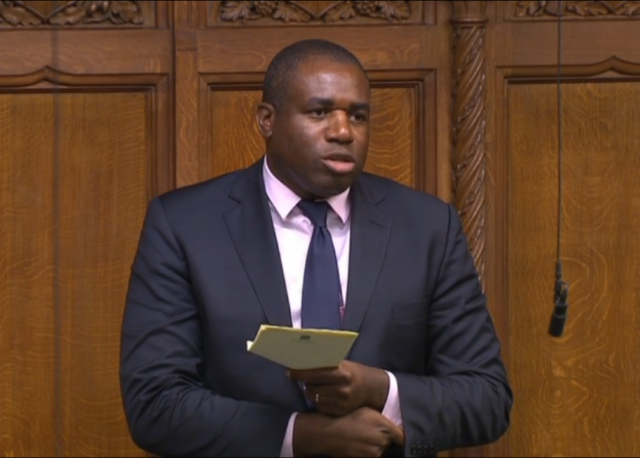 Labour former minister David Lammy said that in black, Asian and minority ethnic (BAME) communities, joint enterprise was undermining "the sense of justice". He said: "In those communities where 14, 16, 19-year-olds have gone to prison for significant time when it's absolutely clear to the community that they've not committed murder, what it actually does is, it undermines the sense of justice system in the black community." Tory former minister Andrew Mitchell agreed with Mr Lammy and accused the police of associating BAME people with gangs and violent crime. He said: "It is an uneasy and difficult truth that an association may exist, unconscious or otherwise, in the minds of the police, prosecutors and juries between being a young ethic minority male and being in a gang, and therefore being involved in forms of urban violence." For the Government, Justice Minister Lucy Frazer said it was "not appropriate" to legislate for joint enterprise. She said: "Joint enterprise, as many members have said, is not set out in statute, it has evolved through case law. "Some criticism was made of this by (Mr Lammy), but the evolution of law through the courts has always been an important part of our common law justice system. "In our law the common law has equal weight with that made by statute." Ms Frazer added: "What is needed is for the Supreme Court judgment to be followed, there is no suggestion that the law itself needs changing, it's just that it needs to be enforced."